Today, August 8, is World Cat Day! In addition, all Rochester Animal Services cat adoptions are only $5 for the month of August! Stop by 184 Verona Street and meet some of the lovely kitties looking for good homes. At http://bit.ly/RAScats you will also find many RAS cats like Domina, Sammy, Chipmunk, Buji and Baby, that are in foster homes. We so appreciate the families that take in cats while they are waiting for homes but we need to find them forever homes too! 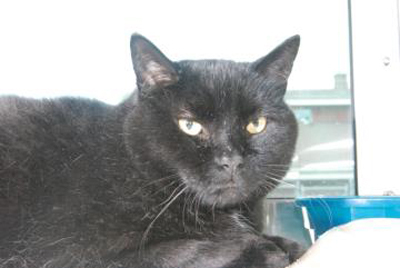 Sam #20384541 Sam is a 6 year old male domestic shorthair mix. He's in the market for a new home and some new laps for his lounging pleasure. Sam is available free of charge to approved adopters, age 60 and over, through our Seniors-for-Seniors program. Come meet Sam and his many feline friends at Lollypop Farm!